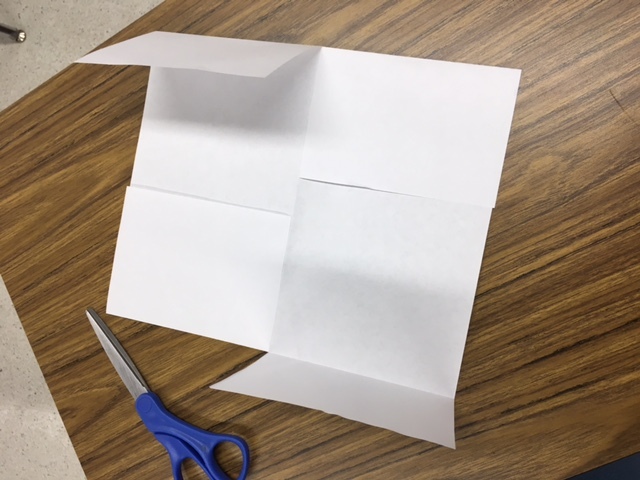 So it’s not a surprise to anyone that I am a super fan of foldables, but I’ve realized that Twitter is not really the place to try to explain how to make and use them, so here we go. Some of them are really complicated (the secret door foldable), but this one is really basic, so here it goes … a step by step of how I make my city foldable, and a way to use it communicatively. What I’ve found is that foldables give me three really great things that I want in my classes. 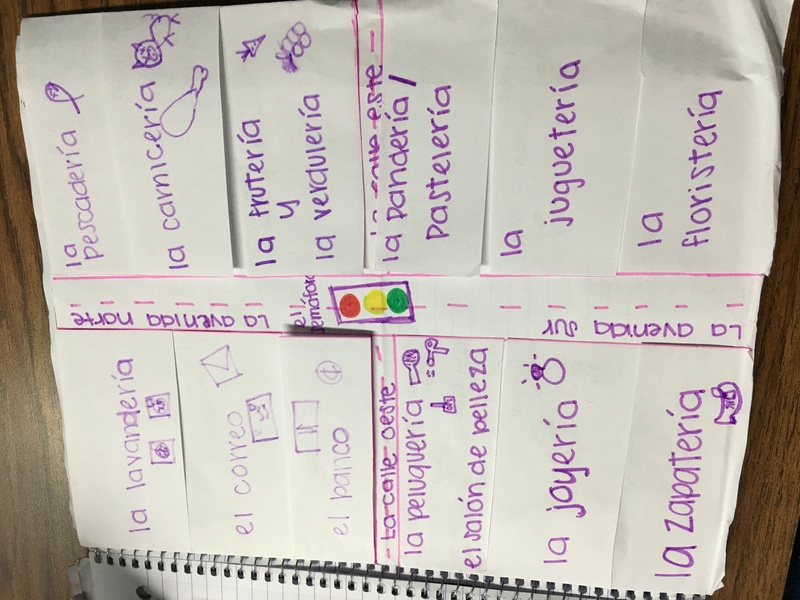 First, they store the vocabulary and structures in a way that is simple, organized, and somewhat artistic. 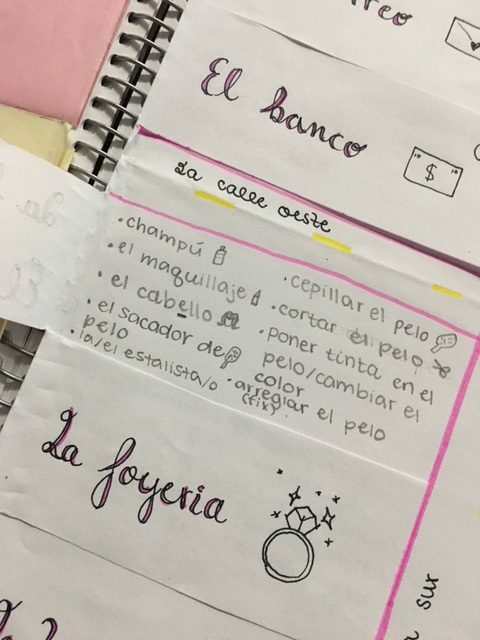 Second, that vocab-storage thing requires listening to me speaking in Spanish the whole time, and trying to make their creation look like mine. (Sra. Spanglish and I started a #foldablefailures hashtag for when the listening and the creating get out of sync) Finally, the foldable is the tool they use as their scaffolded security blanket resource for speaking. I have started to put speaking activities in the middle of things instead of after just to help chunk the content a little more and squeeze in more targeted conversation practice. So, with that all being said, this is my city foldable for Level 2. Level 1 has a city foldable as well, which looks exactly the same structurally, but the stores are different. It’s helpful to do twice because they remember it from level 1 and get why we’re doing the folding. 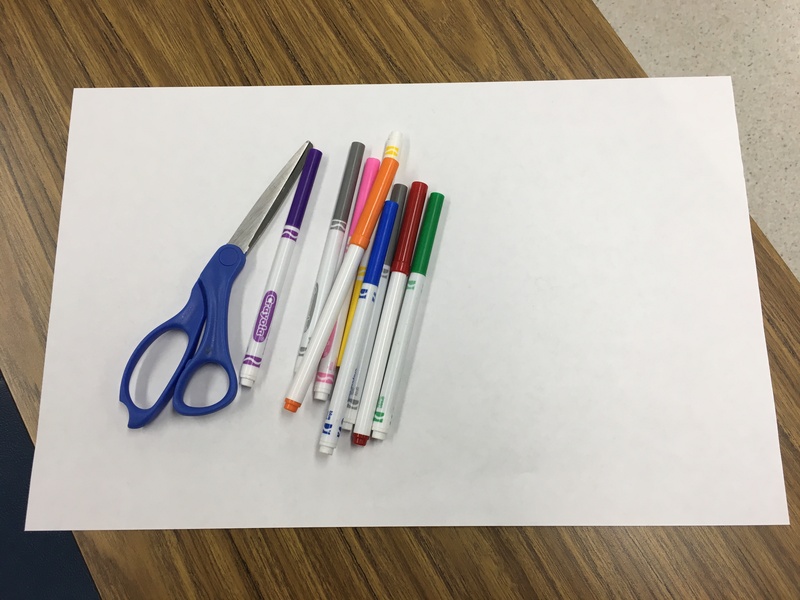 Materials for the initial set up: a few markers, scissors, and a legal size (or larger) sheet of paper. It can be done with copy paper but it feels real small. 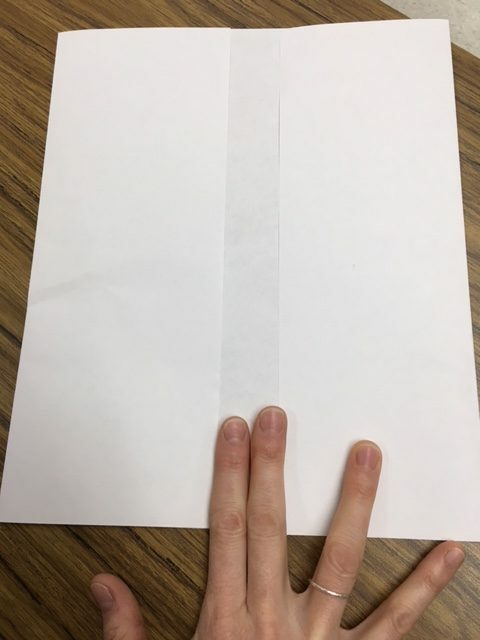 To start, I have everyone fold the paper into a side-by-side refrigerator with a 2-finger space in the center. The space is important because that is going to become one of the main roads in the city. After they have the space, they fold it in half to make a tent. 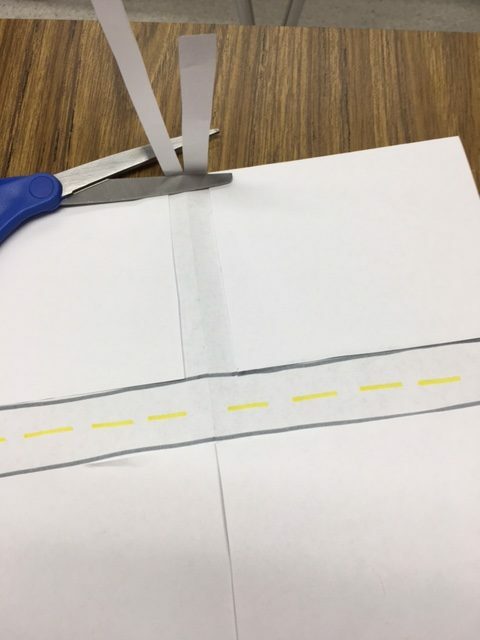 Next we cut to make a finger space sized road running east-west across the middle, which makes the cross street. 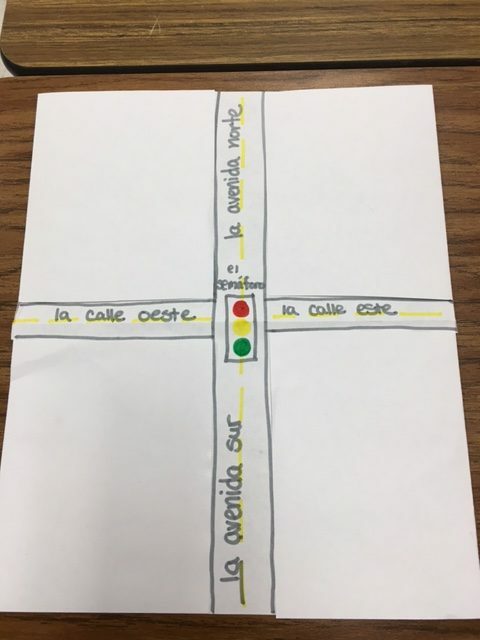 This is a good moment to add the lines and dashes to make streets, label them in the TL (I use north avenue, south avenue, west street and east street) and add the stop light (and its label) in the middle of town. 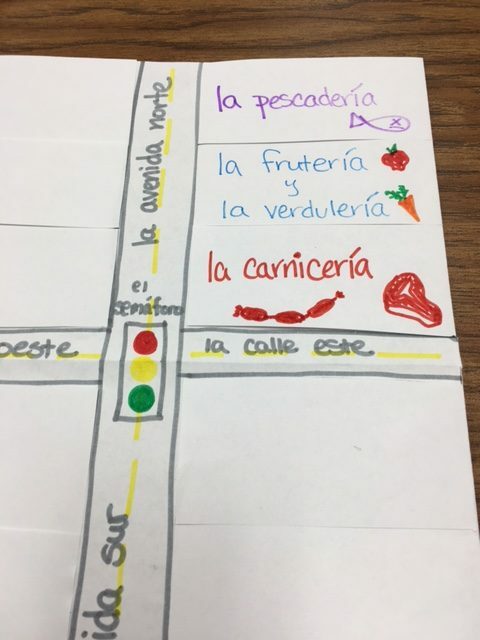 It gives us a little coloring break from cutting and folding and allows me to teach “Will you lend me _____?” because they always want the correct colors for the stoplight, and didn’t pick the red, yellow, green at the beginning. 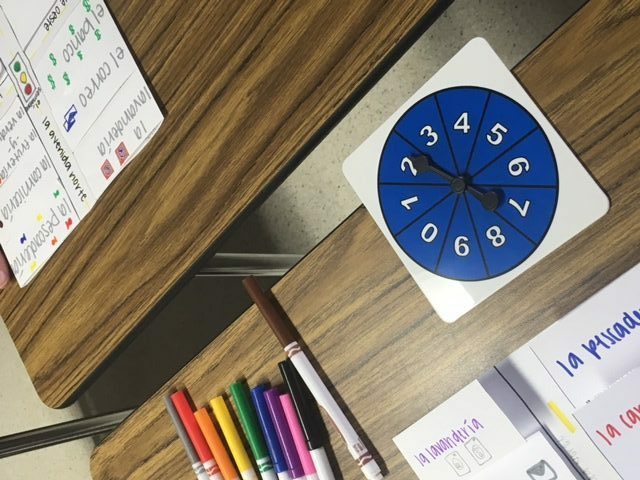 Don’t tell them which colors they need to start with, just have the “Will you lend me ____?” phrase on the board and draw their attention to it when they start scrambling for colors (and asking in English). After that, we cut each block into 3 parts, so we have 12 flaps for the different shops. I put the list of all the stores on the board and ask them in the TL “Where do we want to put the _____?” and someone raises their hand and says “on the top left part in the middle” or something like that and we write in the name of the store. My next question is “Looking at the word __________ what do you think is sold there?” In Spanish, it’s pretty easy: zapatería-zapatos, pescadería-pescado and so on. If they get it right, we draw a little icon next to the word so they remember what it is. 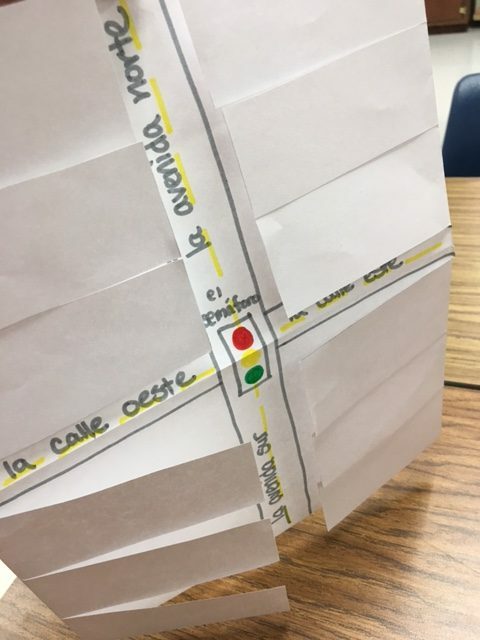 Once they have 6 of the 12 places, we take a 2 minute timed stand-up break, and with our foldables, we wander around asking 3 different people “Do you like to go to this store? Why/Why not?” or “What is your favorite shoe store? Why?” They’re simple questions that don’t require new vocab, but do require them to talk to another human and move their bodies out of their desks. When the timer beeps (I recommend the full-screen timers that you can project that make horrible noises when they ring), everyone sits back down and I have them open one flap. I write “objects” on one side and “actions” on the other, and we brainstorm together what is specific to that place. I add in new vocab for that place, and we draw in reminder icons. We did 3 together before I let them loose in their groups to work. At that point, they get a new timer, and are free to do the other ones in their table groups. If they come up with vocabulary they don’t know, they are allowed to look it up, but I designate one person as the Word Reference person, and they have to draw a reminder icon for the word they look up. That way they’re not all on their technology being distracted, and the kid looking up the word is feeling pressure from the group members to do the job so they can all move forward. Once all six places are filled in, it’s time for another speaking activity. While they were working I put up the 0-9 conversation questions. The questions are open-ended or have follow-up questions, and are only labeled 0-9 because I have spinners that have 0-9 spaces on them. I’d do 6 questions if I used dice, and it works the same. I separate them from groups into pairs, and they have to go sit with their new partner. The first person spins and reads the corresponding question. The partner answers the question and shoots a follow-up question back to person 1. They spin and speak for 3 minutes, then everyone gets up and finds a different partner (I usually have them match shoe color or birthday months or something) and the process is repeated. The ticket out the door, after a few rounds of conversation practice, is that everyone has to write their answers to 5 of the 9 questions with the best Spanish they can manage. They should be pretty comfortable, having done so much speaking, so it doesn’t usually take them long. 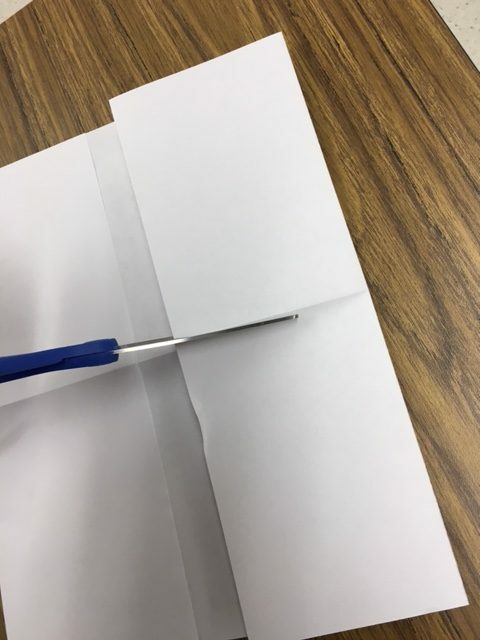 The next day is the rest of the foldable, the same way, but with no more handholding. They already know the process and can do it in groups more quickly. They come up with the vocabulary that they think is important, and when it’s time to move around, they are already used to the rhythm of spin & speak. The only thing I have to do is change the questions to fit the last set of 6 places, and they have all new things to talk about.The most important thing remember while doing this foldable with the speaking interruptions and the group work is to use the timer. When I started this with my first class I didn’t use a timer and was just judging roughly based on the wall clock. The flow was off and I didn’t get the right things happening in the right amounts of time. It wasn’t bad, it was just clunky. I used a timer with my second section of the day, and it went much better.